RPG Maker MV | NIS America, Inc.
An epic journey begins… with YOU! 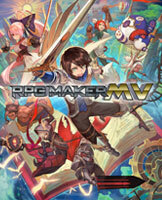 Become a master game developer with RPG Maker MV. With an arsenal of tools at your fingertips, create elaborate, exciting, and memorable video games straight from your console! Then, share your adventures online with other players, who can enjoy your epic chronicles! The possibilities are endless with the latest and greatest RPG Maker software. With hundreds of assets and an infinite number of ways to create your game, turn your dream tale into the next great video game! • Your Next Adventure Begins Here ‐ A high fantasy tale of knights and dragons? A modern story of high school romance? A chronicle of gods and demons? If you can dream it, you can make it! • Game Development Made Easy ‐ Say goodbye to complicated coding! This software provides ease of navigating and development with straightforward world and character creation, overworld customization, and more! • Make, Upload, Play! ‐ Enjoy games made by fellow gamers with the RPG Maker MV Player, free for download and play, even without the RPG Maker MV software! • An Endless Fountain of Customization ‐ With hundreds of graphical assets and an infinite number of possibilities to create your very own world and story, the sky's the limit!